In Chuck Todd we trust; all others must bring data. And right now, we're in something of a holding pattern waiting to see the next turn in the race. Obama's momentum has possibly stalled out, but probably has not yet begun to reverse itself. It's also possible that Obama's momentum was on the verge of reversing itself before Wednesday night's debate, but that the debate was enough to hold McCain off or perhaps even shift things further in Obama's direction. Furthermore, it's possible that the numbers will simply flatline until November 4 as Obama runs out McCain's clock (with no more major events on the campaign calendar, this may in fact be the most likely possibility). We will probably know a lot more about this race by Sunday or Monday, once the impacts of the debate are fully accounted for. At the state level, we have some interesting numbers on both sides. SurveyUSA is the first pollster in a couple weeks to give McCain in Florida; they have him ahead there 49-47. On the other hand, SurveyUSA has yet to show Obama with a lead in Florida all year, so this may not be as newsworthy as it seems at first glance. 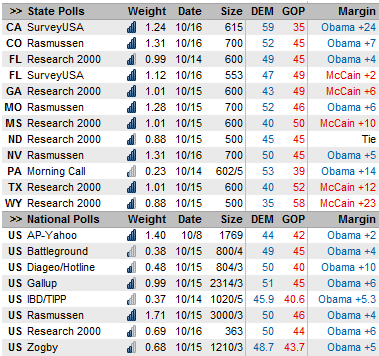 Obama, meanwhile, had a very good day in the Rasmussen polling in Colorado, Nevada and particularly Missouri. As Chuck Todd said on MSNBC a moment ago, Obama may have something of a firewall in Colorado and perhaps Nevada between his strength among Hispanics and the fact that this is probably the weakest region of the country for McCain's ground game. Missouri, meanwhile, has been working itself up the tipping point state list, as Obama's numbers has been improving recently in what we call the "Highlands" region spanning the Ozarks and Appalachians. At a gut level, I think Missouri is one of Obama's tougher states, but remember that Claire McCaskill closed strongly there in 2006, and that Obama closed strongly there on Super Tuesday. Oh -- and another poll shows a dead heat in North Dakota. Our model remains a bit skeptical as Obama has not gained particularly much ground elsewhere in the Prairie region, but it's probably time for both the public pollsters and the campaigns to get out in the field and take the state's temperature.